The business culture worldwide has been undergoing some changes in the past years. Instead of simply putting success stories into the center of attention, it’s now all about learning from business mishaps. 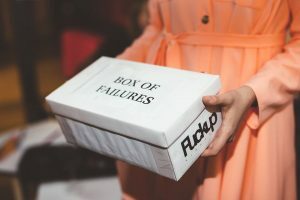 Failures are shared and analyzed in so-called “Fuckup nights”, which are also being held in the CEE region. Fuckup nights is a global movement where failures in and on the job are shared and analyzed – if not celebrated. Originated in Mexico in 2012, the idea has spread around the world and today, Fuckup nights are organized in more than 250 cities, in 80 countries and in more than 25 different languages. In CEE, there are currently Fuckup nights taking place in Belgrade, Bratislava, Bucharest, Budapest, Kiev, Moscow, Prague, Pristina, Sarajevo, Sofia, Tirana, Vienna and Zagreb. A classic set-up for a Fuckup night includes three speakers, who present their mishap in a “Pecha Kucha” style, here meaning ten pictures in seven minutes. The event’s provoking name is the first step to de-stigmatize an error, a wrong decision or a mishap. The events should foster a cultural change on the subject of mistakes and a mindset that leads to success. And it takes some guts to step onto a stage and talk about something that went majorly wrong. People from the Fuckup night movement are convinced that only an open positive culture of dealing with errors enables innovation. Because in such a work environment you can see productivity, quality and work satisfaction increase almost instantaneously. A positive attitude towards errors increases the believe in the company’s vision and the management. It increases trust, because co-workers respect and appreciate each other and each other’s contribution. It enables innovation, because it fosters new thinking. And ultimately, even costs can be reduced as losses can be avoided through early identification and communication of mistakes. Nobody likes having to change directions, backtrack, or start over from scratch, especially when you are working on something big, challenging, or that you are passionate about. But life is full of situations that make us change course unexpectedly. Few people know this better than entrepreneurs. Entrepreneurship is a journey full of failures followed by re-imagining. So, let’s get some of this entrepreneurial spirit and just start again after a mishap. Making mistakes is human. The important lesson is to learn from it and even more, share your experience, so that others can learn from it as well. Making a mistake is not a failure, real failure is giving up. Be proud of your experiences and let the community take part in your knowledge. So, please feel free to post your comment below: What have you failed at today?